A Little Less Romance, but Double the Fun! To some of us that storybook tale of a husband and wife sharing a quiet, romantic evening cooking together and sharing chocolate dipped strawberries, is just that � a fairytale! My boys bring a whole new dimension to the day � not a bad one, just a different one. There is no romantic candlelit dinner for me, but we can still spend plenty of time cooking up celebration as a family. Involve the kids in preparing the meal. They learn so much when we let them into the kitchen and my kids just love it. They really feel like they have done something great when they get to help. Let them help as much as they are able. 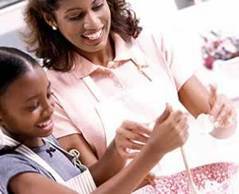 For some children that may mean preparing a course on their own or helping measure and prepare the main course, while for others it may only mean sprinkling sugar on the cookies. You know your children and what they are old enough to handle. Just make sure that everyone gets a part so they all feel the pride of their creation! Simple little things like cutting sandwiches in hearts or making heart jello will make a kids day so keep those things in mind as you prepare your meals. 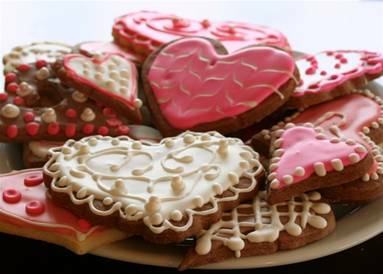 Don�t forget the cookies or cupcakes too. To a child no celebration is complete without a yummy treat. Get the creative juices flowing with some fun crafts. Let the kids decorate the house and share the love their way. They won�t always turn out picture perfect, but your little ones will beam with pride when their creations are displayed around your home. The internet it packed full of ideas and resources to make it nice and simple. Rent a video that is fun for everyone and cuddle up together for some movie time. 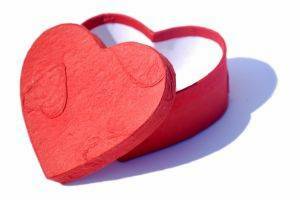 Check out the library and ask the librarian for suggestions for fun Valentine�s movies like Charlie Brown�s Valentine�s Day. Whether you are a scrapbooker or not this is a fun way to catch the day�s events. Take lots of photos while you enjoy the day and then put them together on a page. It can be as simple or as ornate as you like. In fact, if you don�t scrapbook you can still have fun with this. Snap the photos and make a fun piece to frame. You can leave it up year round or put it away to come out each Valentine�s Day. Whatever you do to celebrate the day of love, enjoy it! Make some real momories and document them so you can always remember them!